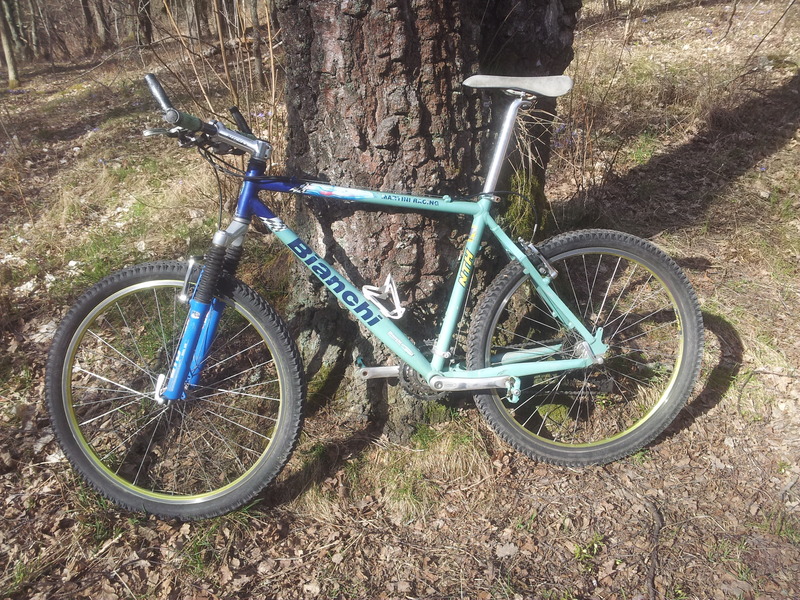 This page will be dedicated to my new project, a Bianchi 26″ Hardtail MTB. I got this bike from a friend in Norway, it was collecting dust in the basement, so I brought it back to Sweden. The frame is a Bianchi team thing from the late 90’s/early 2000, unsure what frame it is to be exact, but well, I like the old look of it, it’s kitted with a pair of XT shifters right now, and has XTR derailleurs, brakes are also XT (V-brakes). The cockpit is a Ritchey one, so is the pedals (in celest color) the front is a Rockshox SID dual air, in the wrong color (imho). Here is a picture of the beauty that is my Mountainbike, pre fixup! So that the wrong, whats been done so far? Well, I swapped the cassette and chain, changed all the wires and tuned the derailleurs. I pumped the fork up to a “acceptable” level, still need to fine tune it, maybe take it apart and swap some seals and change oil. Hopefully this will all go smooth, and if Rose is quick, I’ll be fixing my bike this weekend and getting out on the trails! As of 2014 I sold the bike, it was to small, but it was fun for awhile!